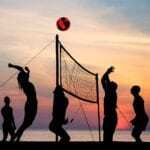 Volleyball is one of the most successful and popular competitive and recreational sports in the world. It is played by two teams on a playing court divided by a net. 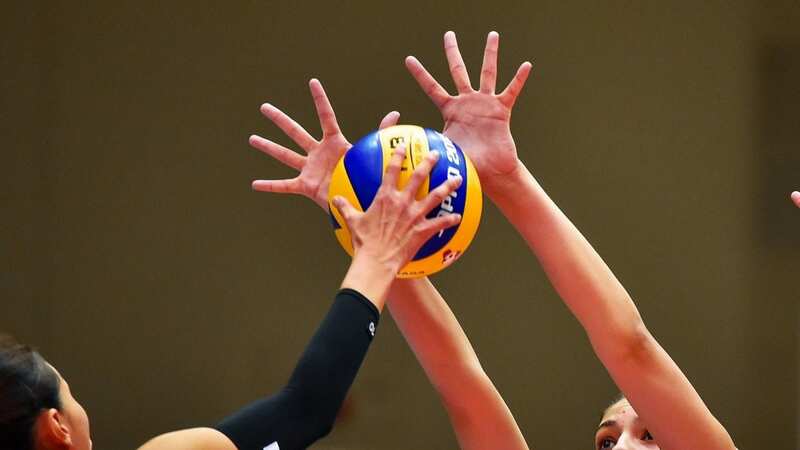 The objective of the game is to send the ball over the net in order to ground it on the opponent’s court, and to prevent the same effort by the opponent. Indoor volleyball is a popular variation of this sport. Here are the rules of indoor volleyball. The playing area includes the playing court and the free zone. It must be rectangular and symmetrical. All lines are 5 cm wide. The boundary lines are the two sidelines and two end lines marking the playing court. Both sidelines and end lines are drawn inside the dimensions of the playing court. The center line divides the playing court into two equal courts measuring 9 x 9 m each. On each court, an attack line, whose rear edge is drawn 3 m back from the axis of the center line, marks the front zone. The free playing space is the space above the playing area which is free from any obstructions. The free playing space must measure a minimum of 7 m in height from the playing surface. The surface must be flat, horizontal and uniform. It must not present any danger of injury to the players. It is forbidden to play on rough or slippery surfaces. The net is placed vertically over the center line with the top set at the height of 2.43 m for men and 2.24 m for women. It should be 1 m wide and 9.50 to 10 m long, made of 10 cm square black mesh. Two white bands are considered as part of the net, which are fastened vertically to the net and placed directly above each sideline, measuring 5 cm wide. Within the bands are flexible cables to fasten the net to the posts and to keep its top taut. The posts supporting the net are placed at a distance of 0.50-1.00 m outside the sidelines. They are 2.55 m high and preferably adjustable. 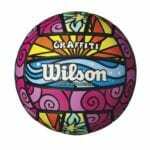 The ball must be spherical, made of a flexible leather or synthetic leather case with a bladder inside, made of rubber or a similar material. Its color may be a uniform light color or a combination of colors. 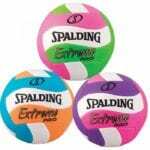 The ball must have a circumference of 65-67 cm and must weight 260-280 g. The inside pressure should be 0.30 to 0.325 kg/cm2 (4.26 to 4.61 psi) (294.3 to 318.82 mbar or hPa). A team may consist of up to 12 players. There should also be coaching staff and medical staff present. Only the players recorded on the score sheet may enter the court and play in the match. One of the players, other than the Libero, is the team captain. This must be indicated on the score sheet. 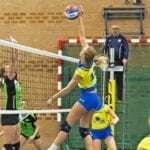 The Libero player must wear a contrasting uniform, in a different color and/or design from the rest of the team, for easy recognition. 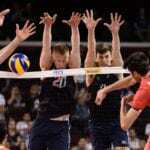 The Libero can replace a back row player but cannot serve, block or attempt to block. A player’s equipment consists of a jersey, shorts, socks and sports shoes. Players’ jerseys must be numbered at the center of the front and of the back. 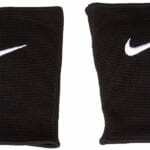 It is forbidden to wear objects which may cause injury or give an artificial advantage to the player. Padded injury protection devices may be worn for protection or support. Players may wear glasses or lenses at their own risk. 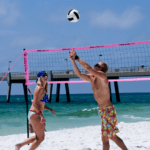 All participants must know the “Official Volleyball Rules” and abide by them. Participants must accept referees’ decisions with sportsmanlike conduct, without disputing them. They must refrain from actions or attitudes aimed at influencing the decisions of the referees or covering up faults committed by their team members. Participants must behave respectfully and courteously in the spirit of FAIR PLAY, not only towards the referees but also towards other officials, the opponent, team-mates, and spectators. A team scores a point by successfully landing the ball on the opponent’s court; when the opposing team commits a fault; and when the opposing team receives a penalty. A rally is a sequence of playing actions from the moment of the service hit by the server until the ball is out of play. A completed rally is the sequence of playing actions which result in the award of a point. If the serving team wins a rally, it scores a point and continues to serve. If the receiving team wins a rally, it scores a point and it must serve next. A set is won by the team which first scores 25 points with a minimum lead of two points. In the case of a 24-24 tie, the play is continued until a two-point lead is achieved. The match is won by the team that wins three sets. In the case of a 2-2 tie, the deciding 5th set is played to 15 points with a minimum lead of 2 points. 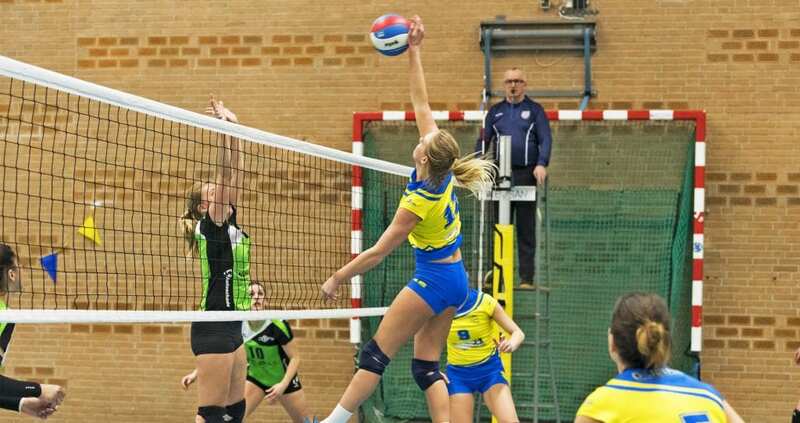 If a team refuses to play after being summoned to do so, it is declared in default and forfeits the match with the result 0-3 for the match and 0-25 for each set. A team that, without justifiable reason, does not appear on the playing court on time, is declared in default. A team that is declared incomplete for the set or for the match, loses the set or the match. 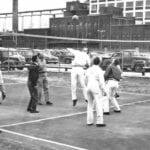 Before the match, the 1st referee carries out a toss to decide upon the first service and the sides of the court in the first set. The toss is taken in the presence of the two team captains. The winner of the toss chooses either the right to serve or to receive the service or the side of the court. And the loser takes the remaining choice. There must always be six players per team in play. The team’s starting line-up indicates the rotational order of the players on the court. This order must be maintained throughout the set. The players who are not in the starting line-up of a set are the substitutes for that set. At the moment the ball is hit by the server, each team must be positioned within its own court in the rotational order. The three players along the net are front-row players and the other three are back-row players. After the service hit, the players may move around and occupy any position on their court and the free zone. The rotational order is determined by the team’s starting line-up and controlled with the service order and players’ positions throughout the set. When the receiving team has gained the right to serve, its players rotate one position clockwise. The ball is “in” if, at any moment of its contact with the floor, some part of the ball touches the court, including the boundary lines. The ball is “out” when all parts of the ball which contact the floor are completely outside the boundary lines; it touches an object outside the court, the ceiling or a person out of play; the ball touches the antennae, ropes, posts or the net itself outside the side-bands; it crosses the vertical plane of the net either partially or totally outside the crossing space; and it crosses completely below the lower space, under the net. The ball sent to the opponent’s court must go over the net within the crossing space. The crossing space is the part of the vertical plane of the net. While crossing the net, the ball may touch it. A ball driven into the net may be recovered within the limits of the three-team hits. If the ball rips the mesh of the net or tears it down, the rally is canceled and replayed. Each team must play within its own playing area and space. The ball may, however, be retrieved from beyond its own free zone. A hit is any contact with the ball by a player in play. The team is entitled to a maximum of three hits (in addition to blocking), for returning the ball. If more are used, the team commits the fault of “FOUR HITS”. The ball may touch any part of the body. It must not be caught and/or thrown. It can rebound in any direction. The ball may touch various parts of the body, provided that the contacts take place simultaneously. A player may not hit the ball two times consecutively. Two or three players may touch the ball at the same moment. When two (or three) team-mates touch the ball simultaneously, it is counted as two (or three) hits. If they reach for the ball, but only one of them touches it, one hit is counted. A collision of players does not constitute a fault. When two opponents touch the ball simultaneously over the net and the ball remains in play, the team receiving the ball is entitled to another three hits. If such a ball goes “out”, it is the fault of the team on the opposite side. In blocking, a player may touch the ball beyond the net, provided that he/she does not interfere with the opponent’s play before or during the latter’s attack hit. It is also permitted to penetrate into the opponent’s space under the net, provided that this does not interfere with the opponent’s play. Players may penetrate into the opponent’s free zone provided that they do not interfere with the opponent’s play. A player may enter the opponent’s court after the ball goes out of play. Players may touch the post, ropes, or any other object outside the antennae, including the net itself – provided that it does not interfere with the play. A team commits a fault by making a playing action contrary to the rules (or by violating them in some other way). The referees judge the faults and determine the consequences. Assisted Hit: a player takes support from a team-mate or any structure/object in order to hit the ball within the playing area. Catch: the ball is caught and/or thrown; it does not rebound from the hit. The service is the act of putting the ball into play, by the back-right player, placed in the service zone. The players must follow the service order recorded on the line-up sheet. The first service of the first set, as well as that of the deciding 5th set, is executed by the team determined by the toss. The other sets will be started with the service of the team that did not serve first in the previous set. 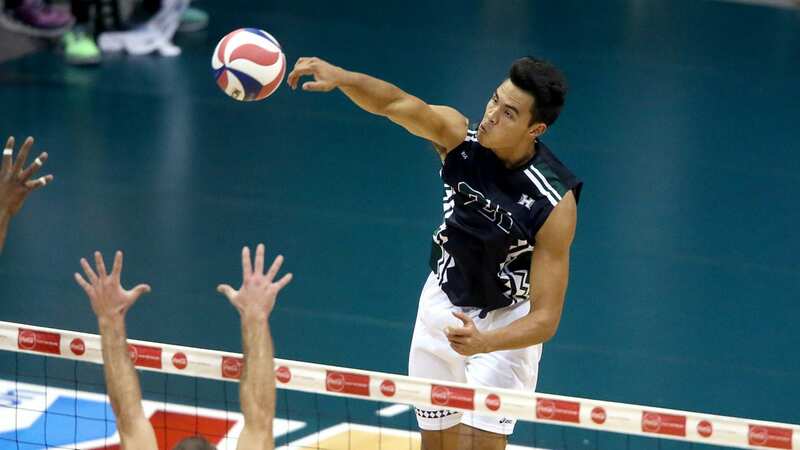 The players of the serving team must not prevent their opponent, through individual or collective screening, from seeing the server and the flight path of the ball. All actions which direct the ball towards the opponent, with the exception of service and block, are considered as attack hits. An attack hit is completed at the moment the ball completely crosses the vertical plane of the net or is touched by an opponent. A block contact does not count as a team hit. 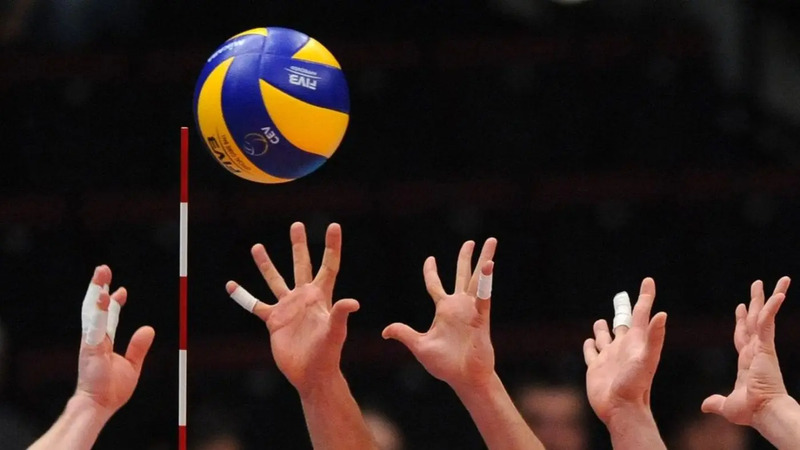 The first hit after the block may be executed by any player, including the one who has touched the ball during the block. To block an opponent’s service is forbidden. An interruption is a time between one completed rally and the 1st referee’s whistle for the next service. The only regular game interruptions are time-outs and substitutions. Each team may request a maximum of two time-outs and six substitutions per set. Time-out requests must be made by showing the corresponding hand signal when the ball is out of play and before the whistle for service. All requested time-outs last for 30 seconds. A substitution is an act by which a player, other than the Libero or his/her replacement player, after being recorded by the scorer, enters the game to occupy the position of another player, who must leave the court at that moment. An improper action of a team that defers resumption of the game is a delay and includes among others: delaying regular game interruptions; prolonging interruptions, after instructed to resume the game; requesting an illegal substitution; repeating an improper request and delaying the game by a team member. An interval is a time between sets. All intervals last three minutes. 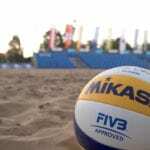 During this period of time, the change of courts and line-up registrations of the teams on the score sheet occur. After each set, the teams change courts, with the exception of the deciding set. In the deciding set, once the leading team reaches 8 points, the teams change courts without delay and the player positions remain the same. The 1st referee carries out his/her functions standing on a referee’s stand located at one end of the net on the opposite side to the scorer. He directs the match from the start until the end and has the power to decide any matters involving the game, including those not provided for in the rules. His/her decisions are final. The 2nd referee performs his/her functions standing outside the playing court near the post, on the opposite side of and facing the 1st referee. The 2nd referee is the assistant of the 1st referee but also has his/her own range of jurisdiction. He/she controls the work of the scorer(s) and supervises the team members on the team bench and reports their misconduct to the 1st referee. He/she also authorizes the regular game interruptions, controls their duration, and rejects improper requests. The scorer performs his/her functions seated at the scorer’s table on the opposite side of the court from and facing the 1st referee. He/she fills in the score sheet according to the rules, co-operating with the 2nd referee. He/she uses a buzzer or another sound device to notify irregularities or give signals to the referees on the basis of his/her responsibilities. The line judges perform their functions by using flags (40 x 40 cm), to signal. The line judges must indicate with the official flag signal the nature of the fault called, and maintain the signal for a moment.